A slide show contains a set of still images that viewers can play in a sequence. After you create a slide show, use the Slideshow Viewer to add still images. Supported file types include BMP, GIF, JPEG, PNG, PSD, PICT, and TIFF. In the Slideshow Viewer, you can also reorder slides, add and reorder audio clips, determine the duration of the slides, and change other settings. You can have more than 99 slides in a slideshow for DVD. Encore accommodates any additional slide you add beyond 99 slides in the last chapter. You can add upto 999 slides in a slideshow for Blu-ray. Encore accommodates any additional slide beyond 999 slides in the last chapter. However, you cannot use Manual Advance on your remote for individual slides in the last chapter. However, Encore does not impose any such limitation on the number of slides you can add to a slideshow for web DVDs. Note: Adobe recommends that for optimum performance, you add no more than 200 sildes in a slideshow. Including additional slides beyond 200 may impact the performance of the software. Use the Properties panel to change settings for the entire slide show or for individual slides you select. After you add slides to the slide show and change the appropriate settings, set a link to the slide show from a menu button or other item. For a video tutorial on creating slide shows, see www.adobe.com/go/lrvid4230_enc. Choose Window > Workspace > Slideshow Design to arrange all the necessary panels for working with slides. To create a slide show from assets in the Project panel, select the still images and audio clips, right-click (Windows) or Control-click (Mac OS) the selection, and choose New > Slideshow. Still images appear in the Slides area, and audio clips appear in the Audio area of the Slideshow Viewer. The name of the slide show is based on the first asset you selected. To import multiple images into a slide show, choose File > Import As > Slideshow, select the images, and then choose Open. In the Properties panel, type the name of the slide show, and type a description. Add images by dragging them from the Project panel to the Slides area in the Slideshow Viewer. To select multiple images to drag, Shift-click them. To expand the Slides area, click the Hide button on the right side of the Slides area to hide Slideshow Options. Click the Show button to view the options again. As you add images to a slide show, they are automatically scaled to fit the project dimensions. You can use the Properties panel to change scaling options of individual slides. Drag the slides in the Slides area to change their order. Use the slider in the lower-left corner of the Slideshow Viewer to zoom in and out. You can also press the + (plus) key to zoom in and the - (minus) key to zoom out. Delete a slide by selecting it and pressing Delete. This removes the slide from the slide show, but it does not remove the image from the Project panel. Learn how to add and modify a complete slideshow. With the Slideshow Viewer selected, click the Play button in the Monitor panel. The slide show previews from the currently selected slide, or from the beginning of the slide show if no slides are selected. You can also choose File > Preview to preview the entire project. Rendering a slide show lets you preview it at a higher quality. Choose File > Render > Slideshows. The options in the Slideshow Viewer and Properties panel affect all slides in the slide show, as long as no individual slides are selected. By selecting one or more slides in the Slideshow Viewer, the options you change in the Slideshow Viewer or Properties panel affect only the selected slides. This gives you the flexibility to set a default transition for all slides in the slide show and then set a different transition for a special slide, for example. When editing individual slides, use the Basic pane of the Properties panel to change the name and description, specify the duration, set scaling options, and create subtitles. Use the Transitions pane to specify a different transition for the slide. Use the Effects pane to specify pan and zoom settings for the slide. If you want sound to play during the slide show, you can add one or more audio clips to the Audio area of the Slideshow Viewer. Only audio files may be added to the Audio area. Supported audio file formats include WAV, AC3, MPEG (layer II), and AIFF. The audio files are played in order during the slide show. Create a slide show, and import one or more audio clips as assets in the Project panel. 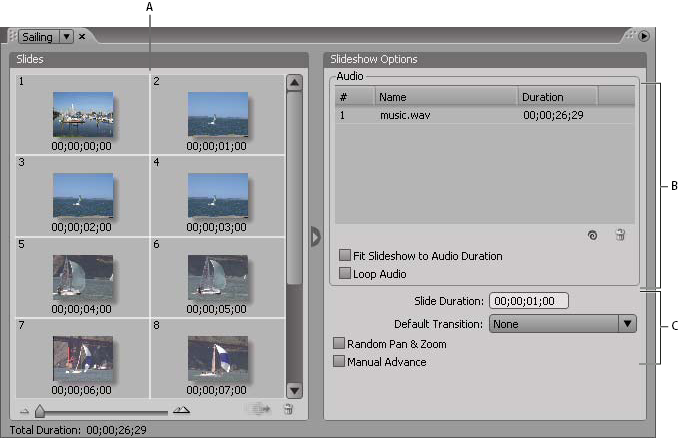 Drag the audio assets from the Project panel to the Audio area of the Slideshow Viewer. If necessary, adjust the order in which the audio files are played by dragging them elsewhere in the list. Adjusts the length of each slide in the slide show equally, based on the total duration of the audio file or files specified, ensuring that both the audio and slides finish at the same time. This option overrides the individual slide duration settings. Continues playing the audio clip or clips until the slide show ends. 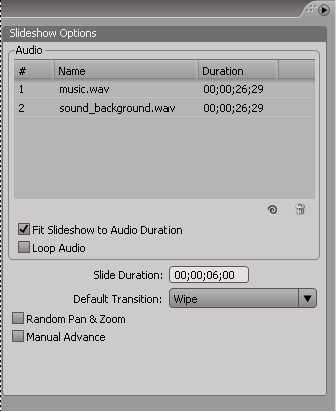 This is especially useful if the slide duration exceeds the duration of the audio clips. You can apply a default transition to all slides in a slide show or to individual slides. You can customize many of the transition types you select using the Transition pane in the Properties panel. To apply a transition to the entire slide show, deselect all slides and, in the Slideshow Viewer, select a transition other than None from the Default Transition menu. To set a transition for individual slides, select one or more slides in the Slideshow Viewer, and choose the transition in the Transition pane of the Properties panel. If you want a slide to use the same transition as the slide show, select Match Slideshow. Specify the duration of the transition. Specify additional options, if any, that appear in the Transition pane of the Properties panel. For example, if you selected the Wipe transition, you can specify the direction of the wipe and the border width and color. The pan and zoom effect provides a sense of motion to still images. Panning refers to moving across the image, and zooming refers to changing the image’s magnification. A pan and zoom effect is often used in documentaries to make pictures appear more dynamic. To apply a random pan and zoom effect to all slides in the slide show, select Random Pan & Zoom in the Slideshow Viewer. Encore randomly assigns a pan and zoom setting to each slide. You can keep the settings as assigned or modify them for individual slides in the Properties panel. To apply pan and zoom settings to an individual slide, select the slide in the Slideshow Viewer, click the Effects tab in the Properties panel, and then specify the Pan and Zoom settings (such as East To West and Zoom In). When you select Random Pan & Zoom, you can see the pan and zoom direction of an individual slide by selecting the slide and viewing the pan and zoom settings in the Effects pane of the Properties panel. You can change the pan and zoom settings for the individual slide. In the Slides area of the Slideshow Viewer, select the slides you want to scale. In the Properties panel, click the Basic tab. Proportionally scales the slide so that the entire image fits the frame, applying a matte as necessary to fill any blank area of the frame. Proportionally scales the slide until it fills the frame, cropping any area that exceeds the frame. Maintains the original dimensions of the image. The slide is centered. Any portion of the slide that exceeds the frame is cropped. Unfilled areas of the frame are matted in black. If you want to emphasize a different part of the scaled image or change other crop or matte effects, edit the image in Photoshop. To specify the duration of all slides in the slide show, change the Slide Duration value in the Slideshow Options area of the Slideshow Viewer. To change the duration of individual slides, select one or more slides in the Slideshow Viewer, deselect Match Slideshow in the Basic pane of the Properties panel, and change the Duration value. If you select Manual Advance, slides don’t advance unless viewers click Next or Previous. To select Manual Advance for the entire slide show, deselect all slides, and select Manual Advance in the Slideshow Viewer. To select Manual Advance for individual slides, select one or more slides in the Slideshow Viewer, and select Manual Advance in the Basic pane of the Properties dialog box. Adding subtitles to your slide show is easy. Use the name or description of each slide as the subtitle. 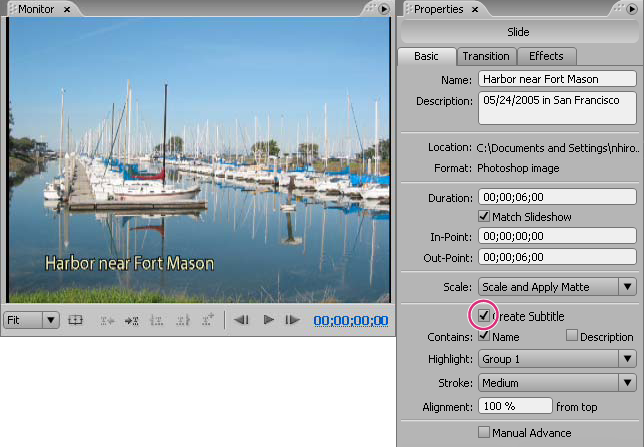 You can change other options, such as the color group, stroke, and position of the subtitle. The starting time and duration of the subtitle match those of the slide. In the Slides area of the Slideshow Viewer, select the slide to which you want to add a subtitle. In the Properties panel, click the Basic tab, and select Create Subtitle. Choose an option from the Highlight Group menu. Choose the stroke weight for the subtitle text. Specify the alignment of the subtitle within the slide. Specifying 0% places the subtitle at the top of the slide, and 100% places the subtitle at the bottom of the slide. To change the subtitle, modify the name or description that you based the slide show on.